This series of twelve books corresponds to the twelve months. 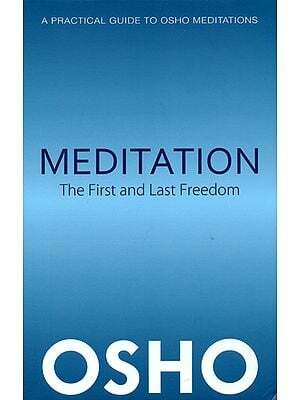 For each day Osho has given a morning contemplation and an evening contemplation. “Month One” need not necessarily be the beginning of the calendar year but is the first month you begin to read. These short, inspiring meditations have been arranged to be read chronologically rather than randomly, as Osho’s understanding of life is developed through each month. The worlds on the following pages are extracted from talks the enlightened master, Osho, has given to His disciples and to other seekers visiting His commune in Pune, India. Most of the photographs were taken within the commune: Osho with His disciples and guests, seekers meditating, working, or simply being. It is said that the last thought in one’s mind as one falls asleep is also the first thought on waking. Perhaps the majority of us fall asleep with minds crammed with images from a television drama, with worries about the day that has passed and anxieties about the day that is to follow. A good many of us have trouble entering sleep at all. The pieces selected for the evening have been specially chosen for the night-time. This series of twelve books is divided into twelve months, of thirty-one days each. “Month One” need not necessarily be the beginning of the calendar year but is the first month you begin reading. 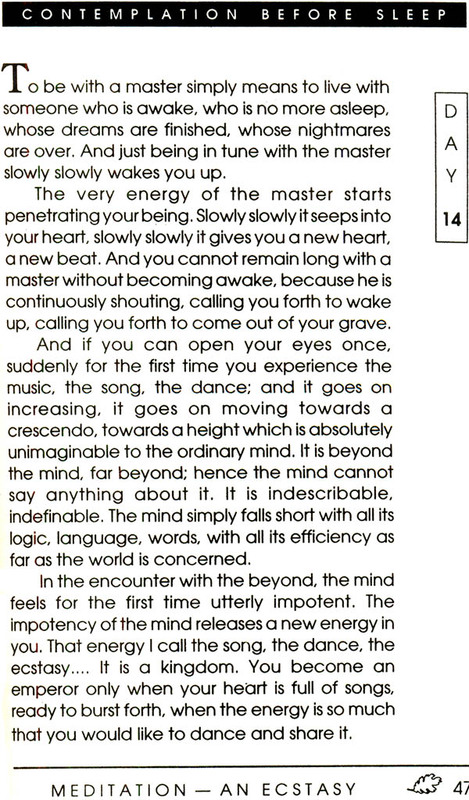 The passages have been designed to be read chronologically rather than randomly, as Osho’s understanding of life is developed through each month. The books have been planned in such a way that each day has particular theme, and the subject of the morning and evening complement each other. The quotations used for the morning contemplations are stimulating, sometimes pithy, sometimes exuberant—always endorsing a lively, total participation in the day to come. By contrast, Osho’s words for the evening remind the reader of the significance of relaxation, expansion, meeting, letting go. Reading these passages is in itself a form of contemplation because, as Osho has said. The words of a mystic are not part of any kind of theory to be accepted or refuted; the reader is not asked to be a follower or a believer. In fact, it is not even the words themselves that are of significance, but rather what the words convey. He explains: “(The mystic’s) words carry a silence around them, his words are not noisy. His words have a melody, a rhythm, a music, and at the very core of his words is utter silence. If you can penetrate his words you will come across infinite silence.